Odon Wagner Gallery is pleased to present the winning painting of the 2013 Kingston Prize, Basement Self Portrait, by Canadian artist Richard Thomas Davis, for a special two week viewing. 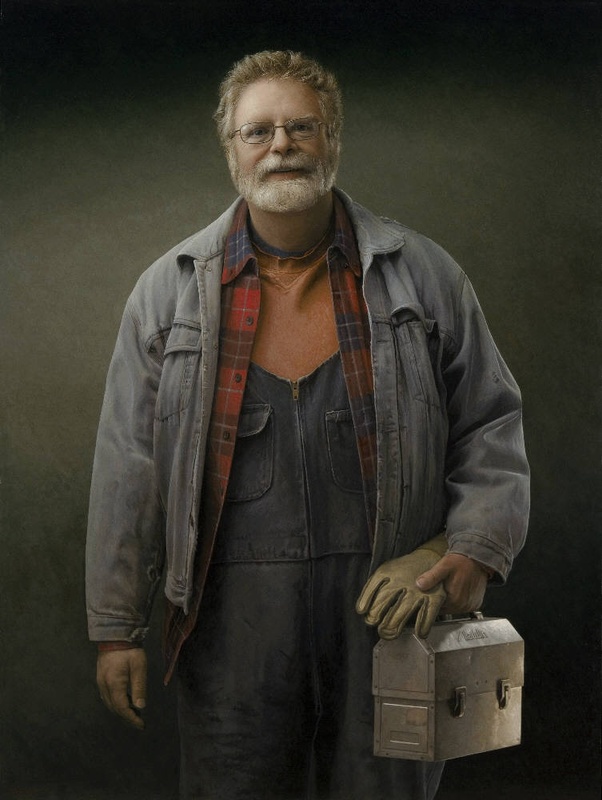 Basement Self Portrait will be hung alongside a collection of paintings by Davis that illustrate his astute ability to capture life in high realism, including Aladdin, which won the 2011 Kingston Prize People's Choice Award. The Opening Reception on Saturday, February 8th (1 – 4pm) will have in attendance Richard Thomas Davis, as well as the founders of The Kingston Prize, Kaaren and Julian Brown. "Richard Thomas Davis's facility as a virtuoso of painterly realism is everywhere balanced and deepened by the artist's equal recourse to a kind of painted poetry. In a painting like his Basement Self-Portrait, for example, the entire work is bathed in an uncanny silvery light (note, by the way, how effectively and eerily and the tondo-shaped mirror provides a subtle surrogate for the moon). It is this recalibrated and extended employment of painterly light that locates the painting in the realm of the numinous. The apparent realism of the painting can initially distract us from its inherent mystery. The protagonist of the picture, if we can call him that, a portrait of the artist himself, is both fully revealed as a physical presence and yet, at the same time, remains troublingly elusive as a portrait of Being. Although the figure inhabits most of the picture plane, he is nevertheless essentially unavailable, turned away from the viewer as he scrutinizes the mirrors (a small rectangular one set against the larger, circular one), in a moving search for the ambiguously located site of the self. Davis's detailing is prodigious note, for example, his handling of the wrinkling of the tucked-in shirt, his inclusion of the manufacturer's label just above the trouser pocket, his exquisite attentions to the crack in the surface of the table, and to the nubbly, chalky texture of the basement wall. But where this kind of exactitude might weight down a painter possessing only a practised technical skill, Davis's paintings are located so as to offer a rich melding of realism and lyricism. It is this eliding of an outer verisimilitude and inner unknowability that lends them much of their expressive power." Richard Thomas Davis was born in Middletown, New York in 1947. He studied at the Pennsylvania Academy of Fine Arts in Philadelphia from 1965 – 1966. Davis's scrupulously painted views (whether of landscape, cityscape, human-scape or object-scape) are offered as ruminations upon that which will not be still, but now is still. It is as if he has withdrawn the air from his paintings. And consequently, his paintings which, now evacuated, have moved from studies of those things inhabiting the world to a new status as icons of the moment. Davis's iconic stillness is not the iconic stillness of religious devotion or transporting awe. Rather, his paintings offer modalities of a contemporary devotion—to objects, faces, cars, buildings and the residual landscape. (excerpt from Gary Michael Daults exhibition introduction, 2011). 2013 Kingston Portrait Prize for "Basement Self Portrait"
1993 Sponsor’s Prize, 2nd Sapporo International Print Biennale for “Landmarks"